Since 1938, the Mint Julep has been the official drink of The Kentucky Derby – the result of a brilliant collaborative effort between Churchill Downs and The Kentucky Derby. On average, 80,000 Mint Juleps are consumed at the “Run for the Roses” each year. 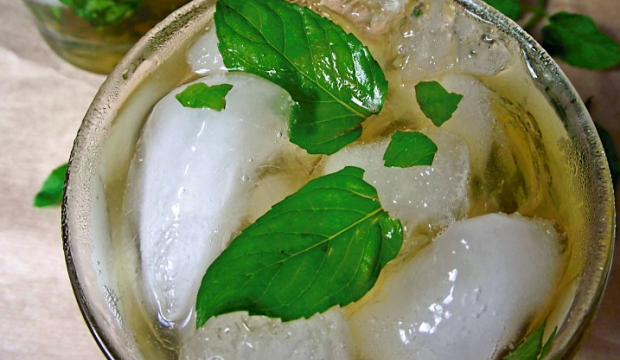 There are countless opinions on the proper making of a Mint Julep – the four main ingredients being mint (traditionally spearmint), bourbon, sugar (sometimes syrup), and water. They were originally served in silver or pewter cups; however, today they are served in commemorative glasses which can serve as collectibles or mementos for derby goers. It is very important to hold your Mint Julep properly as the heat of the holder’s hand can reduce the amount of frost on the glass and quickly take the chill off an otherwise refreshing adult beverage. However, taking into consideration the heat of the day and the celebratory atmosphere, it is quite likely that the “fastest two minutes in sports” may be the consumption of a Mint Julep by enthusiastic patrons rather than the heroic efforts of those beautiful three year old thoroughbreds.